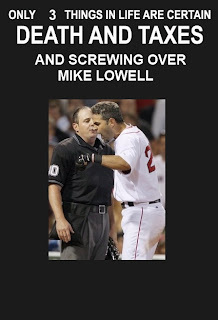 Youk to the DL (to be fair he's one of the only 2 guys not to be there yet) and Lowell gets promoted to The Bigs. In true Mike "F*ck you for keeping me down" Lowell fashion, the dude put the first pitch he sees over Tha Monsta. Wicked pissah dude. As for Youk to the DL though? Come on?!? My belief is that there is someone that pulls the strings of all the teams in the MLB and obviously that person wants no part of a team featuring Marco Scutaro to make it anywhere this year. With all the injuries (the count is at 74) this team could have actually competed... but the strings keep getting pulled. Damn you strings. Damn your stringyness. As for our updates, or lack thereof lately, well sometimes life gets real and gets in the way of our love of Sox and bloggy goodness. We're here and somewhat alive and we'll try to give this whole "posting more than once a month" thing a try. Not that we're really missing any good baseball as the Sox just kind of complacently lament (I don't know what either of those words mean) in the middle of the AL East, but we will try.